It's about time, i've been waiting for my city to get a frequent RER/S-Bahn type of railway network for ages and Québec's pension fund (CDPQ) has announced the official construction of the REM - Réseau Express Métropolitain (or Metropolitan Express Network in english) to begin in April! Rolling stock supplier will be a consortium constituted of Alstom while construction of the network will be a consortium consisting of SNC-Lavalin. Basically, the REM involves the conversion of the existing Deux-Montagnes line (Montreal's busiest commuter train line) to rapid transit standards. At the same time, this line will continue all the way to the city's south shore via the new Champlain bridge being built. There will also be a branch going all the way to the West Island and another branch to the city's main Airport. It is planned to become the world's fourth largest fully automated railway. During off-peak hours, trains will run with two cars and during rush hours, they will run with 4 cars. Due to Montreal's strong winters, pantograph/catenary technology will be used instead of third rail and stations are supposed to be fully temperature controlled since they will have full platform doors and therefore, fully enclosed. 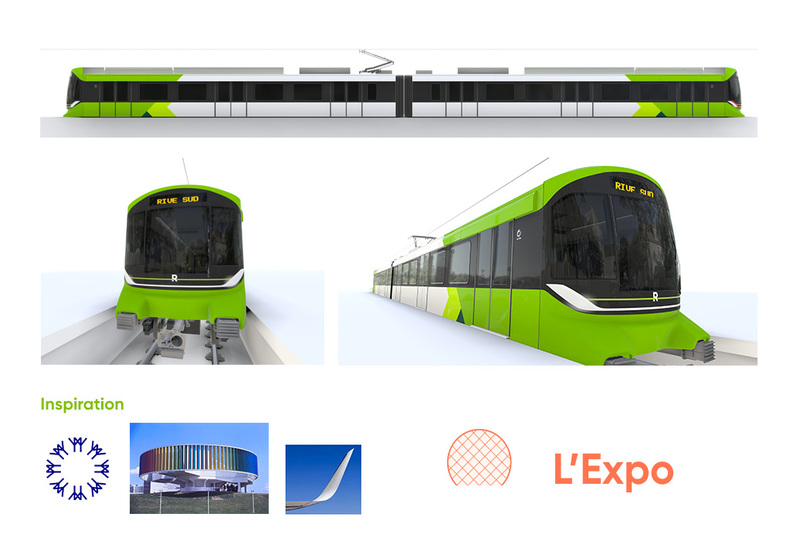 It's interesting to notice how they refer to the project as a Light Metro or Light Rail, because the infrastructure is similar to that of heavy rail and it has been confirmed by the CDPQ Infra that the types of trains used will be from Alstom's Metropolis family (in their technical sheet, they require each car to be 20m long and 3m wide). 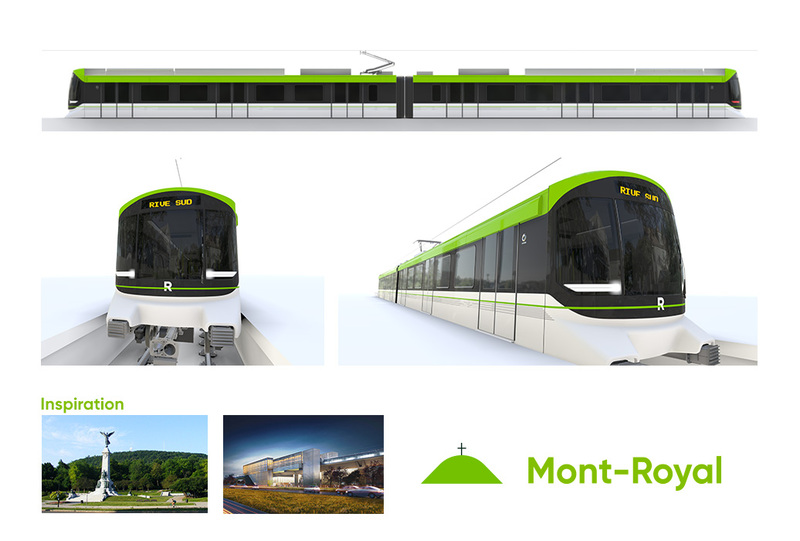 Another point is the fact that the line will be using the Mont-Royal tunnel. This tunnel is crucial to VIA Rail's planned High Frequency Railway line because it would allow quick access to downtown. The problem is that according to the CDPQ Infra which is the creator of the REM project, the technology used by the REM would be incompatible with "heavy rail" trains and it would be complicated to integrate a manned train in a line of fully automated trains. They are currently studying the possibility of creating a technology that would allow VIA Rail and the REM's trains to run on the same tracks (I suspect VIA Rail to use EMU trains with the same ATO system as the REM while on the same segment of the line for this to work). Here's a bit more details! A few pictures of the future stations have been released. Perhaps Crossrail's case can be examined regarding combining/interfacing CBTC with legacy systems. The alstom metropolis trains are indeed heavy metro, but light rail when compared to the crashworthiness standards of the real railways. This means they must not be allowed to mix with heavy trains on the same line. (at least according to european regulations) This means if the shared tunnel in question will have to support both the metro and the normal mainline trains (using european rules), then in each direction only one type could be in the tunnel (including all blocks) and appropriate protection (derail stubs) must be provided for the other type of service with the signalling and turnouts interlocked to protect against accidental signal passed at danger-s. On the bright side, this means the ATC/ATO/ATS systems could be swapped over between the two systems and manned trains could enter the tunnel while all automatic ones are stopped or the other way around. At least this is the easy fix and works as long as train frequencies for all 4 types of services (metro, suburban emu, long distance loco hauled and freight) are very low. The hard fix would be to strengthen the metro trains to mainline standards and either integrate automatic operation into all mainline trains involved or add human drivers to the metro trains for the shared section only. Considering the tunnel in question still has some freight rights on it and (afaik) a slight gradient, imho digging a new metro only tunnel would be much easier and cheaper. It's an interesting solution to have only 1 type of train per direction in the tunnel. However, perhaps VIA Rail should get EMUs with the same type of crashworthiness standards as the Alstom Metropolis, which I don't think would be VERY difficult since they plan on using railway tracks where only passenger trains would have the right of way. The thing is, if I remember correctly, they would want to share their tracks with other passenger trains (such as commuter trains) and then these would also have to be built by those standards. The best solution I can think of is just using different types of trains with the same ATP and ATO systems. By the way, sorry for the double post, but here's the new official website of the project where you can find some illustrations of the futur stations! We still don't know what the railcars will look like though (they use trams in some of their illustrations but that's really not what it's going to be). So now we know what the Alstom Metropolis will look like, the public is given 3 choices to vote for. My personal favourite is the first one (Saint-Laurent). A design with character, inspired by the architecture of the new Champlain Bridge and the crossing over the St. Lawrence River. The green line along the side symbolizes the new bridge. The R superimposed over it represents the REM that crosses it. The headlights are distinctive and their diagonal lines are a reference to the cables on the new Champlain Bridge. A clean design along horizontal lines. Its completely green roof symbolizes Mount Royal, which is the lungs of the city and an iconic landmark crossed by the REM. A colourful design and chaotic geometric shapes: this model is a nod to Expo 67 and to the cultural vitality of Greater Montréal. The three shades of green and the geometric shapes are a throwback to the design styles of the era. The headlights are inspired by the wings of an airplane, a nod to the new link to the airport and Montréal’s openness to the world. I also like the first option, albeit with a few different modifications, mainly different, more "traditional-looking" headlights and added a thin dark green line over the light green one. Plus i had fun imaging a logo for the REM, it's supposed to be both a stylized map of the REM (with all three western branches meeting in the city center plus another going out eastwards) and representing the "Fleur De Lys", one of the symbols of Québec. The lettering "R E M" also comes in three different colors: the two greens are from the train itself, while the blue of the "M" is taken from the Quebéc flag. Wow, you really went all out in this one, I really like this! You should actually send all of this to the REM's official twitter or facebook page, I am sure they would appreciate it!. i agree the traditional headlights looking nice too! They are still taking general suggestions. I heard that a lot of people are requesting the second one (Mont-Royal), but with the first one's head lights and they are taking note, so who knows! The official rolling stock design has been revealed by Alstom today! It's the one I voted for, so I'm happy with the outcome! So glad to see this project is actually moving forward. As a long-time Montrealer with family and friends still in the city, I look forward to the day when I can ride the train downtown from the airport.This is long overdue, but I hope it won't suffer the same fate as other big-time projects (1976 Olympic stadium, MUHC super hospital, etc...) I'm curious to see how the project will accommodate the city's long, cold and snowy winters. 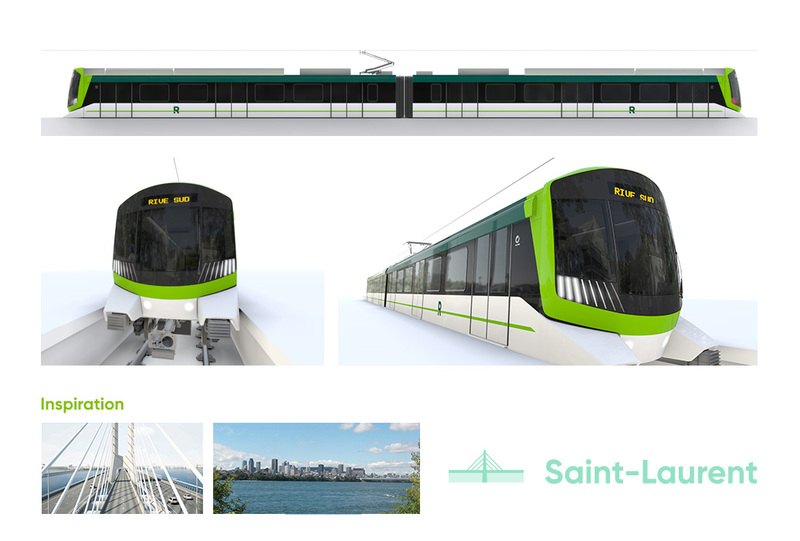 In re the new Montreal emus, the green and white livery is pretty conventional, nothing special, the slotted headlights, will they actually throw any light forwards, and the awful looking protruding coupler, does it need to stick out so far? For the headlights, there should also be a row of slots vertically up the centre, then this array would look like the Fluer de Lys of the city's Arms. If you look closely at the latest renderings, there seems to be round headlights beside the slotted ones, except they are not on in the picture, I guess to put an accent on the shape they were trying to use. As for the coupler, I definitely agree that it looks ugly, wish it didn't need to stick so far. About the livery, it's pretty conventional but to be honest, it's gonna add "colour" to our city's transportation network because for some time, every passenger train, excluding Via Rail, was blue. The metro's signature colour is blue, the commuter trains were blue when they were operated by the AMT but now that exo has taken over, they will have a different colour for each train car and the REM is simply adding to that diversity. Personally I like the livery of the REM because it reminds me a bit of one of Keihan's most recent rolling stocks. Those slotted headlights seem to be following the latest style in modern cars, many of which have a row of upward sloping small lights on each side of the front, what purpose these serve, I do not know! Perhaps to let people know that there is a car approaching? With regard to the green and white livery, perhaps we should give the operating people there a few Tomix EMU models with fancy liveries! Sorry about the double post earlier on, hit the wrong button! I realise that the drawing of the new REM sets is only a concept drawing for the livery, I assume that they have the usual roof mounted air con units, but are these heavy duty ones to allow for the higher heating loads required for the severe Canadian winters, or are there separate heating units as well as the normal a.c. units? They will definitely have roof mounted air con units, I guess they are just not obvious in the renderings. Our winters in Montreal can get pretty harsh, so to compensate, on top of having heating A/C, the floor will also be heated. The CQPD Infra has been stressing that those trains are being designed with Montreal's winters in mind, because there has been a lot of skepticism regarding the vehicles' capacity to endure our winters since it's not rare for the current MR-90 on the Deux-Montagnes line to break down during because of the weather. On top of that, the front windshield will also be heated, as well as the couplers and the bottom of the doors (the part where they slide). It will be interesting to see how well it's going to endure snow storms, as well as -30 C (felt).